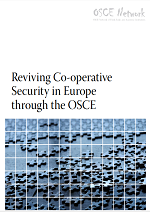 The prevailing deep political confrontation and distrust between Russia and the West hampers the efficient utilization of existing structures and instruments for cooperative security in the OSCE’s framework. The confrontation is furthermore fuelled by the ever-diverging value systems between the key participating States and more broadly within the OSCE community. At the same time, the role that the OSCE could play today in the form of providing a common platform for mediation and conflict prevention is more important than ever, as military tension and the likelihood of accidents and conflict escalation is increasing.